A small parcel of conservation land in Framingham. My KMZ map is from the Framingham Conservation Commission map from the link above. 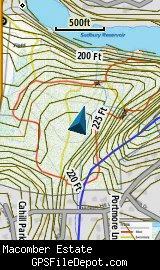 This KMZ map is set to Draw Order 40 so it will show 'beneath' your primary map (but 'above' 'Ashland Town Forest' - see version history below) on your Garmin KMZ-compatible GPS. Version 7 of Google Earth introduced a new 'feature' - when opening KMZ files, the view automatically 'tilts' to an oblique angle. By specifying the tilt angle (zero) in the KML file, this version of the Macomber KMZ map (1.12) prevents Google Earth from tilting the view. There were no other changes to the map - so if you don't mind the tilt view in Google Earth, or if you are not using this KMZ file in Google Earth, there is no reason to download this update. Removed spaces from file names (JPG). Changed draw order to 40. 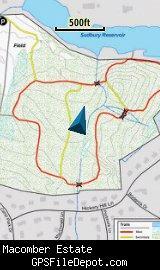 I noticed that this map overlaps with my Ashland Town Forest KMZ <http://gpsfiledepot.com/maps/view/569/>. If you have both on your GPS (like I did), Ashland Town Forest would 'obscure' the western edge of Macomber. Changing the draw order corrects the problem (and there is nothing important that gets obscured from having Macomber 'over' Ashland Town Forest KMZ).